Bad habits are hard to kick, but if you need an extra push, it helps if you think of quitting as a matter of life and death. Consider how these habits contribute to your risk of cardiovascular disease—the number one killer in America. Heart disease causes about 610,000 deaths in the United States every year, which means about one in four people die from heart complications. The Centers for Disease Control and Prevention says high blood pressure, high cholesterol, and smoking are the key risk factors for heart disease and that about half of Americans are at risk. Thankfully, according to the World Health Organization, about 80 percent of heart disease can be prevented, and you can reduce your risk by replacing your bad habits with moderation. It takes about 66 days to turn a practiced behavior into a habit, so just think of yourself as two months away from fully adopting a healthy lifestyle. Take the expert advice below from our team at Elitra’s Manhattan Longevity Center and cut out the habits holding you back from a long, healthy life. Tobacco use is one of the main risk factors for heart disease. Chemicals in tobacco can contribute to heart attack risks, as these chemicals lead to plaque build-up in your arteries. Carbon monoxide also reduces the amount of oxygen in your blood, forcing your heart to work overtime, which increases your blood pressures. It doesn’t matter if you are merely a social smoker or just socialize with smokers. Secondhand smoke and low-tar or low-nicotine cigarettes will still increase your risk of heart disease. Female smokers on birth control are also at greater risk of blood clots that can cause heart attacks or strokes. You’ve probably heard people say that red wine is good for the heart (as they pour themselves a glass of vino). However, the studies purporting red wine reduces your risk of heart disease are largely observational. Some studies say moderate amounts of alcohol can benefit your heart by raising healthy cholesterol, among other reasons. According to the Mayo Clinic, however, there is no clear evidence that red wine is better for your heart than other forms of alcohol. The key takeaway here is to practice moderation. According to the American Heart Association (AHA), having more than two drinks a day for men and one drink for women can interrupt heart rhythms and cause heart failure. We aren’t telling to give up on life’s pleasures—just break the habit of mindlessly consuming alcohol. Practice moderation and avoid sugary mixers and add-ins that can cause your blood sugar to spike. When drinking, opt for a glass of water in between glasses of alcohol. Staying hydrated helps increase blood flow, which reduces strain on your heart. Ignorance is not bliss when it comes to your health. Just because an evaluation years ago didn’t identify you as at risk for heart disease doesn’t mean you’re still perfectly healthy today. Left unregulated, high blood pressure (hypertension) and high cholesterol can strain and seriously damage your heart and blood vessels. About half of people with untreated hypertension die of ischemic heart disease and another third die of stroke. A physician at Elitra’s Manhattan Longevity Center can monitor your heart health, identify risk factors, suggest lifestyle changes, and recommend the right medications to keep your numbers under control. We’ve developed the Elitra Exam—a personalized Executive Physical Exam—where patients undergo a full-body checkup, including a complete cardio-pulmonary evaluation. Our world class doctors and clinical team will lead you through onsite cardiac imaging, extensive screenings, and advanced bloodwork to develop a personalized medical report ready for you at the end of your visit. You’ll leave your Executive Physical Exam knowing exactly where you stand with your heart health and what you need to do going forward. A healthy heart is linked to a healthy mouth, and skipping flossing and infrequently replacing your toothbrush are both bad habits you should break. The Journal of Periodontal Research published a 2014 study that found people with coronary heart disease who flossed suffered from fewer cardiovascular problems. One theory is that gum disease can cause bacteria to attach to fatty deposits in your blood vessels, which can lead to blood clots and heart attacks. Poor gum health can also lead to periodontal disease, which is another risk factor cardiovascular disease. According to a 2014 study published in AHA journal, people who sit for five or more hours every day are twice as likely to experience heart failure. 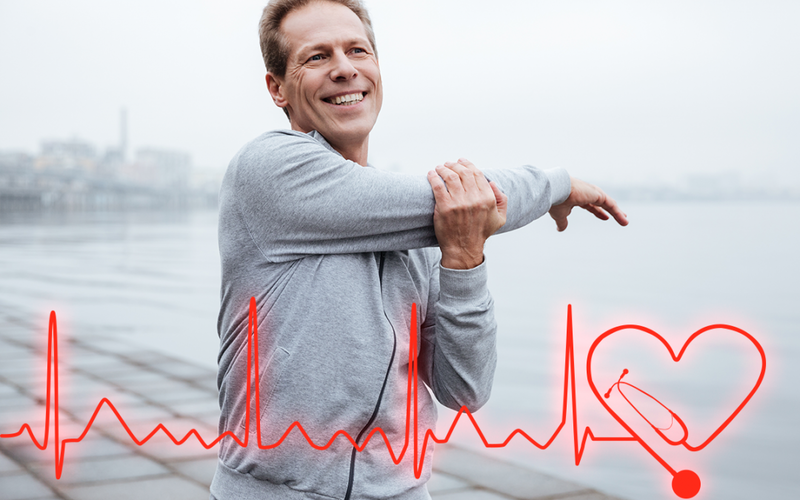 From increasing HDL cholesterol and insulin sensitivity to lowering blood pressure and heart rate, exercise is key in strengthening your heart. An Exercise Physiologist at Elitra’s Manhattan Longevity Center can lead you through a full-health consultation that analyzes your muscle mass, body composition, and heart health to develop a personalized fitness plan. Even if you have a desk-bound job, we can come up with a fitness guide right for your life. Reaching for the chips every time you turn on the TV at night or constantly ordering the cheeseburger are habits that can weaken your heart. Foods high in saturated fat (red meat and full-fat dairy) and trans fat (fried foods and refined carbs) can increase your cholesterol level and cause plaque to build up in your arteries. This, in turn, increases your risk of heart attack and stroke. A high sodium diet can also contribute to high blood pressure and increase your risk of heart disease. A nutritionist at Elitra’s Manhattan Longevity Center can conduct an in-depth nutritional consultation and develop a personalized nutrition plan to help you reduce the sources of sodium and saturated and trans fat in your diet. They can break down what has good and bad cholesterol and plan meals and snacks to keep you winning at your goals.